WHEELCHAIR USERS AND people who are blind or deaf will now be able to climb and abseil in Dublin. 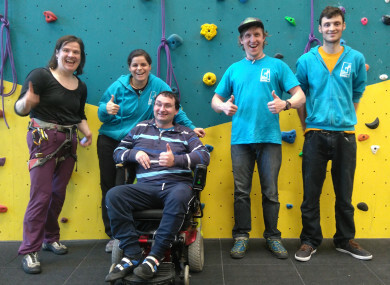 Accessible climbing sessions are being offered at Dublin Climbing Centre and people are being invited to attend today as part of National Accessibility Week. The sessions will be suitable for people who are blind, visually impaired, deaf, hard of hearing or people who have intellectual disability, autism or people with mobility impairments including wheelchair users. Disability Liaison, Access and Equality Officer at South Dublin County Council Selina Bonnie said, “When I heard that they were developing facilities that allows disabled people such as wheelchair users to abseil and climb a wall I had to check it out. The facilities enable people including those with limited body movement to enjoy the experience of climbing. An experience that perhaps they thought might never be an option for them. The Mayor of South Dublin County Council Paul Gogarty and Irish Paralympian Deirdre Mongan will officially open National Accessibility Week in the Dublin Climbing Centre, Tallaght this morning. The Climbing for All sessions will take place between 12pm and 4.30pm. There are three sessions lasting approximately an hour. Each session is designed around different abilities, skills and needs and places are restricted so advance booking is essential. Email “Wheelchair users and people with disabilities can now climb and abseil in Dublin”. Feedback on “Wheelchair users and people with disabilities can now climb and abseil in Dublin”.